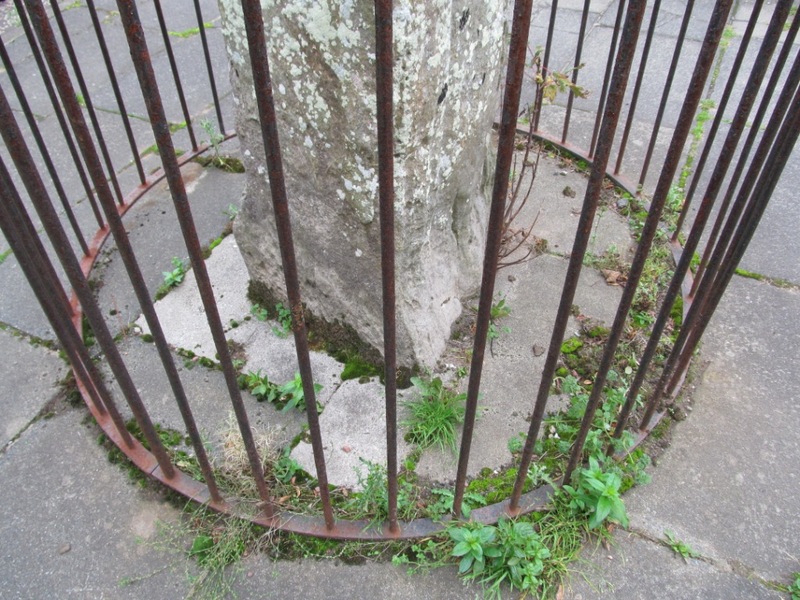 Behold the imprisoned standing stone, behind rusting bars. What is the purpose of the corroded, spiked bars that surround the megalith? Is it for its own protection, or are we being protected from the stone? It has been ensured that the stone has no means of escape, sealed into the very fabric of the pavement within which it sits, bound by cement and concrete. Weeds congregate at its base. 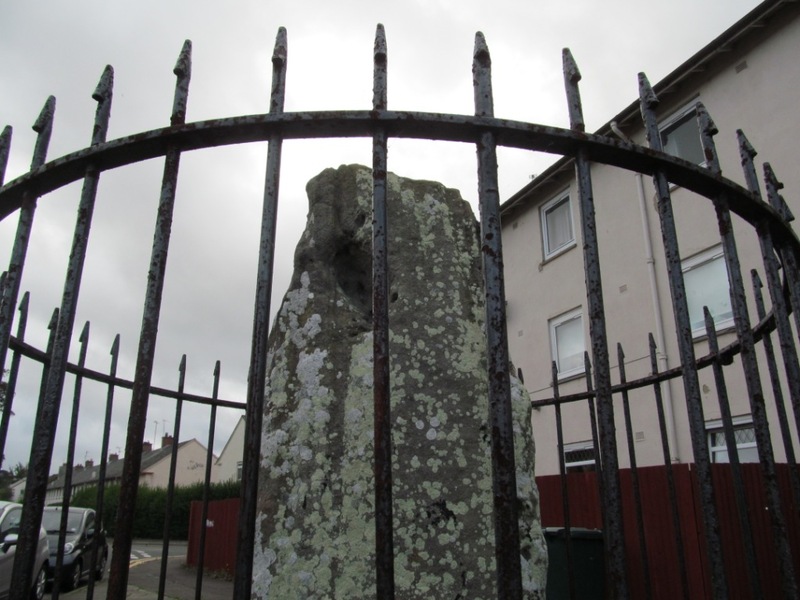 The stone sits in a quiet cul-de-sac, surrounded by cars which form another layer of defence against this megalith; high fences and hedgerows shield some local householders from the sorry spectacle of the mute megalith. What would happen if the megalith uprooted itself, to maraud around the surrounding neighbourhood, perhaps even make an attempt to contact fellow standing stones and form a circle? The stone itself is rough and splattered with black blobs. Has the stone been tarred and feathered? Is the cage little more than a pillory at which substances can be thrown at the stone through the gaps in the bars? For me, this is not a cage, and not a prison. It is a reliquary that holds a precious relic of the ancient past, for pilgrims like me to come and pay respects. 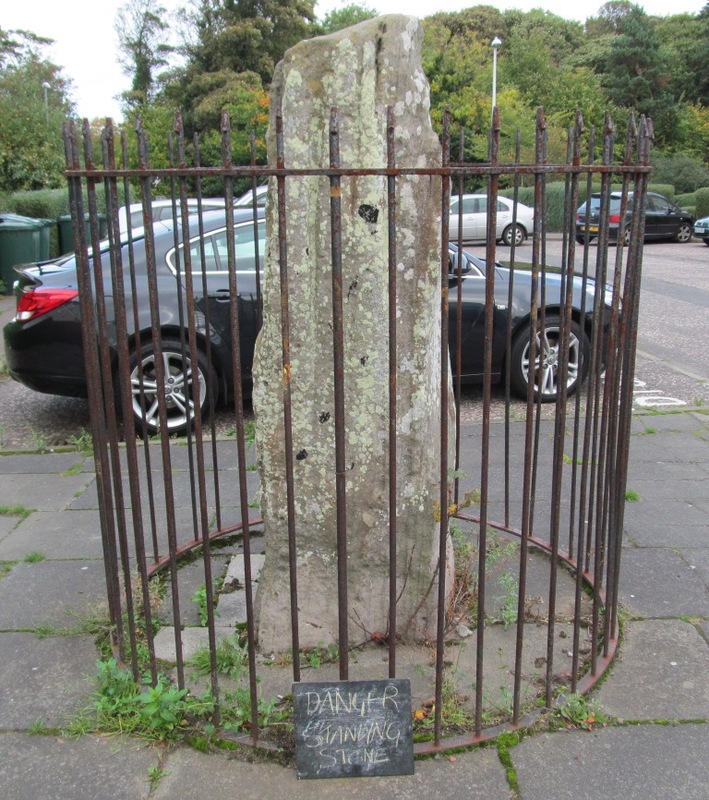 The incarcerated megalith stands on Ravenswood Avenue, on the south side of Edinburgh. The stone has not always been in this location, either contextually or spatially. In 1903 FR Coles described the stone as being located in open countryside, on Liberton Glebe, ’66 yards SW of the Dalkeith Road’. He described the solitary standing stone as being ‘very grey’ and somewhat incomplete in its form, marked by ‘vertical grooves’ on two sides, and ‘one large ear-like cavity’ towards the top. An illustration accompanying this description shows the rural disposition of the standing stone, with the Salisbury Crags still visible in the background. A lone contemplative figure leans against the stone, which itself leans, while luscious leaves lap against the base of the stone. The stone was shifted from this location as the urban spread of Edinburgh washed up against its rough exterior. 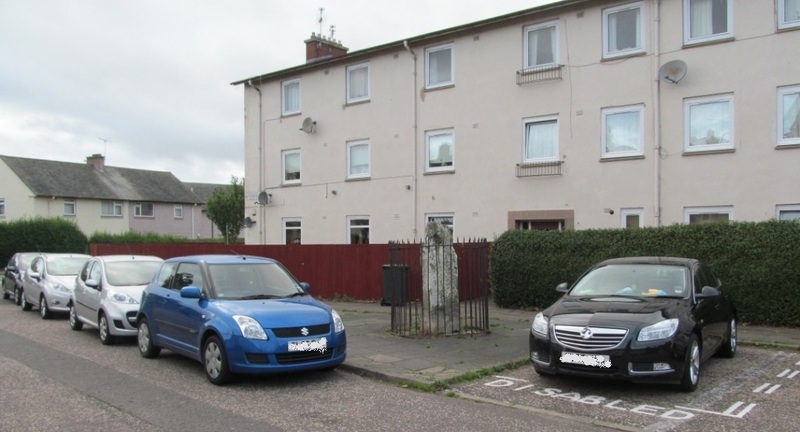 Perhaps in the 1960s, as the houses around it were being built, with associated infrastructure, the stone was moved a few metres, probably because otherwise it would have stood in the middle of the road it now sits beside. Nothing more is known about this standing stone. 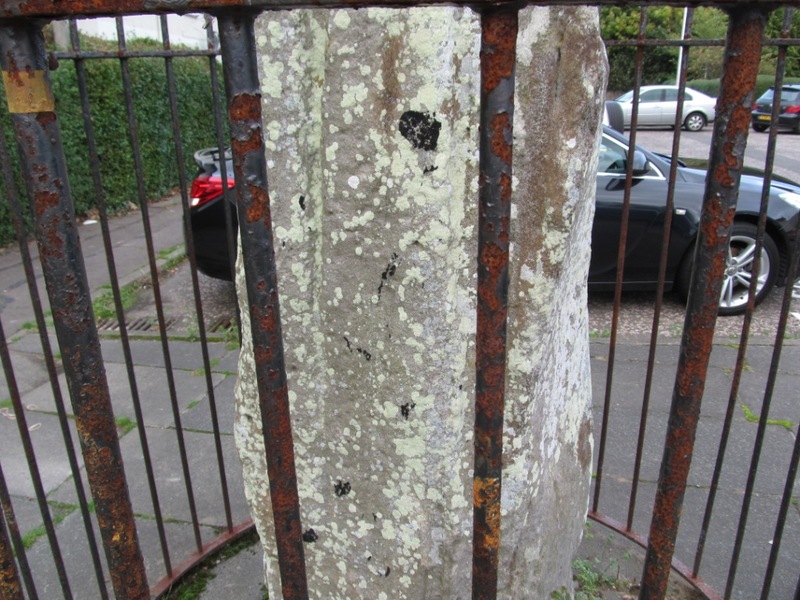 Sources: The 1903 account of the standing stone comes from an article by Fred R Coles in volume 37 of the Proceedings of the Society of Antiquaries of Scotland that covers a range of miscellaneous prehistoric things from across Scotland. 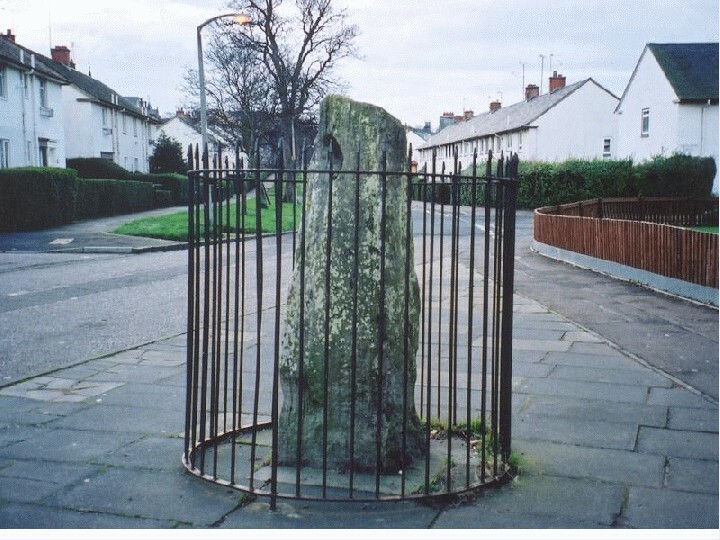 The Ravenswood / Liberton Glebe stone is covered in section ‘(3) A cairn and standing stones at Old Liston, and other standing stones in Midlothian and Fife’ (see pages 204-5). 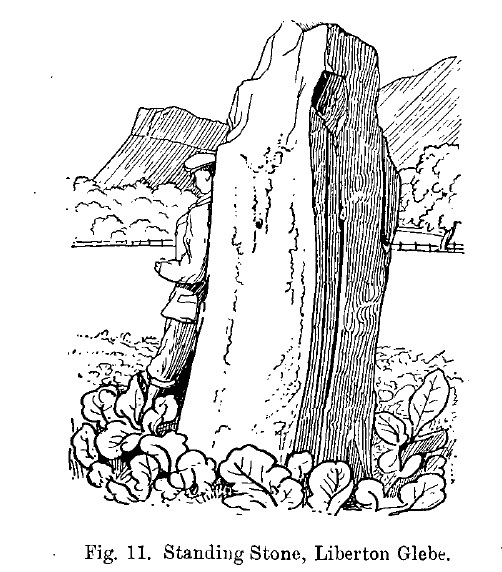 The drawing is sourced from this article.A few other bits and pieces can be found in the CANMORE entry for this standing stone, NMRS number NT27SE 106. The ‘ear photo’ was sourced from the Modern Antiquarian entry for this monument, photo taken by ‘Martin’.